The functional yet stylish Michael Kors Access Runway smartwatch merges an iconic silhouette with next-evolution technology. Crafted in rose gold tone stainless steel, powered by Wear OS by Google™. The functional watch also offers payment methods, heart-rate tracking, swimproof functionality and more to suit your fitness and convenience needs. 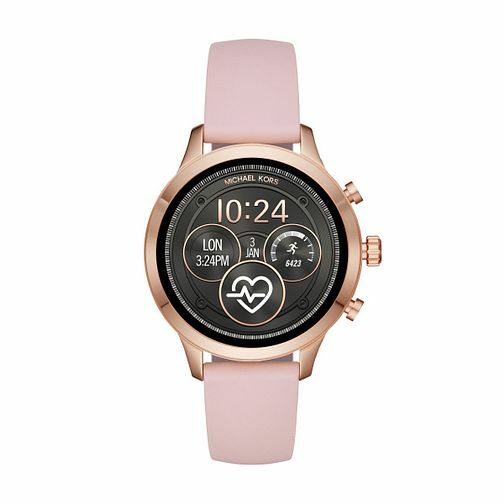 Michael Kors Gen 4 Ladies' Runway Rose Gold Tone Smartwatch is rated 3.7 out of 5 by 3. Rated 5 out of 5 by Anonymous from Fantastic Brought this watch as a birthday present not to long ago and I have to say my girlfriend cannot stop talking about this to all her friends and family. Pleased to say she is a very happy women which would mean a very happy man. Thanks for the great items and wonderful service.